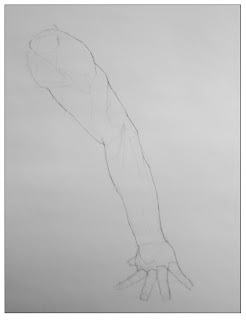 Paint Draw Paint, Learn to Draw: Drawing the Arm, How to draw the anatomy of the arm. 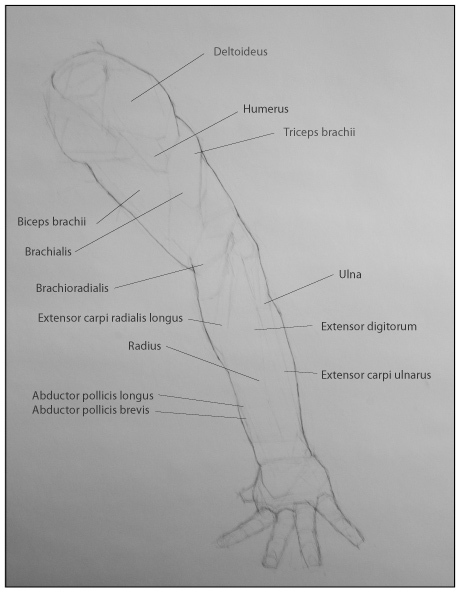 Drawing the Arm, How to draw the anatomy of the arm. 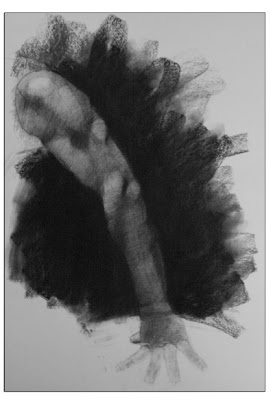 I like to practice looking for the underlying anatomy of the body. That is, I try to identify and draw where the bones and muscles belong on the body, in this case I am drawing an arm. This requires a little imagination and some study to do, but it is a fun exercise to try. To see what I do, click read more. 1. I draw the arm from a reference. My reference is from a photograph I took of a model some time ago. When doing this exercise still look for and draw all the plane changes and shapes in the arm you can. This will be helpful later on. 2. 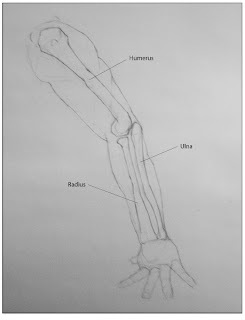 Using reference books on human anatomy*, I locate the bones I need to draw and determine where the bones fit in the arm in order to draw those bones in place. This tricky because the diagrams in your reference material will not match the position of the arm you are drawing. So the shape may not be exact, but do the best you can in placing the bones in the right position. 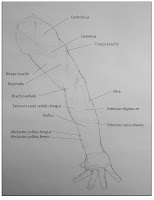 Look for bony landmarks on the models arm and use these as guides to figure out the placement. 3. Still looking at my reference guides, I identify which muscles I need to draw and locate the placement the muscles to draw those in their proper place. 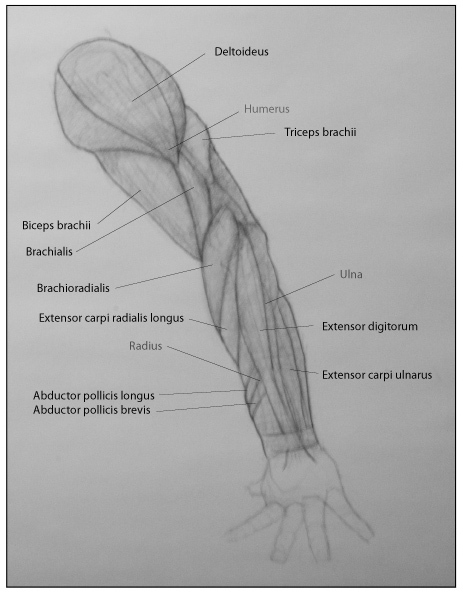 Again, this can be tricky as you have to look for the muscles as the relate to your drawing. The plane changes I laid down earlier served as a guide in helping me find the placement and shape of each muscle in the arm I am drawing. I labeled the muscles in the drawing to the right. The more familiar you are with the bone and muscle structures, the easier it is to draw the figure. 4. 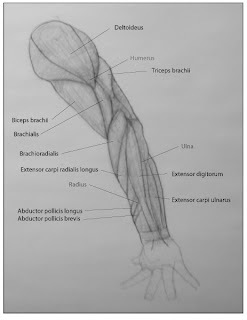 Now that I have found the where the bones and the muscles belong and how they should look, I can have some fun with this exercise and draw over the muscles to create a realistic looking arm. Each muscle has an origin and an insertion point. The origin is the point where the muscle begins and is attached to a bone. The opposite end of the muscle is called the insertion, attached to a different bone. When the muscle contracts between these points the body will move. I mention this because it makes it easier to understand where and how the muscles should be placed when drawing the body. Also, learning about how the muscle functions is a good guide to learning about surface anatomy. There is plenty of information on this and the muscles in Wikipedia.